This is a great card layout and can be used for a variety of occasions, it’s fun to make and is a blank canvas that can be decorated however you fancy. Here we show you 3 ways to style your cards. Build your freestanding template in white card, and cover the front with Winter Woodland pinecone paper cut to 10 x 15cm, add a strip of heart washi tape to the top of the card. For the topper use the base of the mouse decoupage sheet mounted on foam squares. 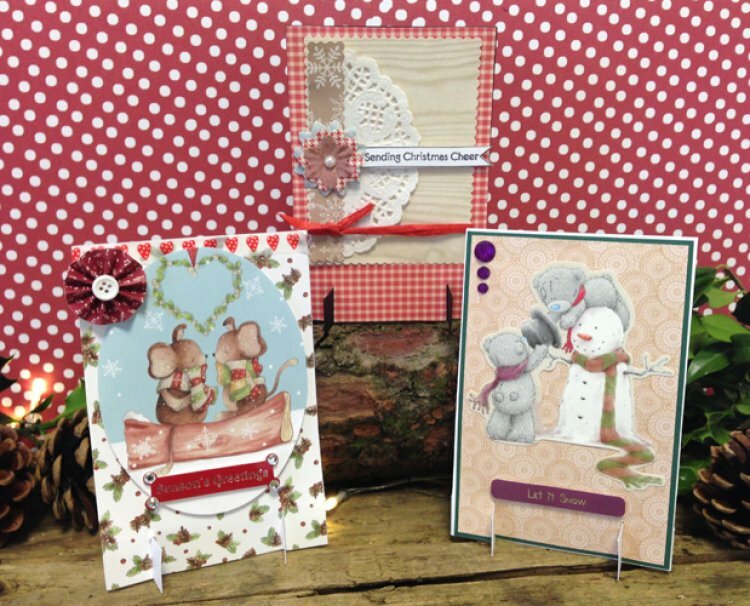 Finish with a sentiment topper and accordion sticker in the top left corner. Make your base out of white card then cut a piece of green card to 9.5 x 14.5cm and layer with gold doily paper cut to 9x14cm. Stick down the Tatty Teddy snowman sticker to the front of the card and add the Let it Snow sentiment under the sticker. Add 3 glitter purple gems down the left hand side of the card. Cut your template out of black card and cover with red gingham paper. Cut a rectangle of wood print card to 11.5 x 8.5cm and trim the edge with scalloped scissors. Cut a doily in half and glue the flat edge down the left hand side of the wood print card. Trim a piece of snowflake paper to 11 x 2cm and again trim with the scalloped scissor before gluing on top of the doily, wrap a length of red raffia around the scalloped rectangle and tie with a bow. Stamp the Sending Christmas cheer sentiment on white card and cut out, stick down using foam squares and cover the end with a layer of blossoms, finished with a pearl. Glue the built up layer onto the red gingham base. We hope you like our new card layout, if you make this card please share in the Project Gallery.